The CloudFormation template grants your SFTP Gateway EC2 instance access to all S3 buckets in your AWS account. This is because SFTP Gateway needs the ability to create custom S3 buckets, or point users to existing buckets. Once you're done setting up your users and S3 buckets, you should lock down S3 permissions on the IAM role. 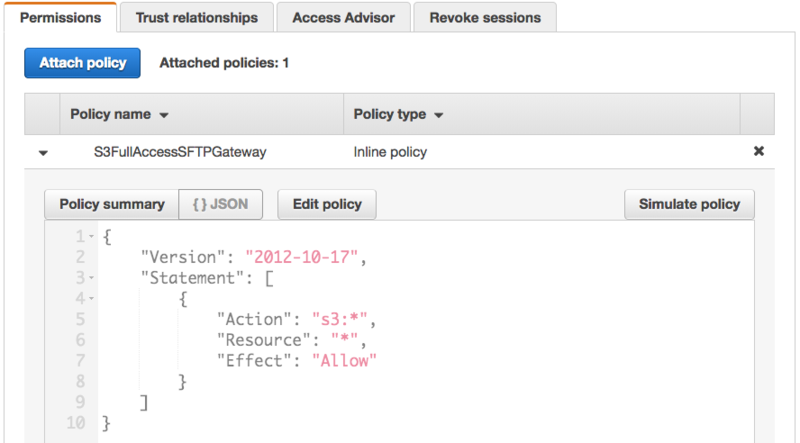 Go ahead and delete the S3FullAccessSFTPGateway inline policy by clicking the x button to the right. In the pop-up modal, click Remove to confirm. Next, click the + Add inline policy button on the bottom right. Name the policy something like "CustomS3Policy", and finally click Create policy. The inline policy you created restricts your SFTP Gateway instance to a single S3 bucket, and all the objects within. Note: Even if you set all your SFTP users' upload destinations to custom S3 buckets, you should still grant permissions to the default bucket.